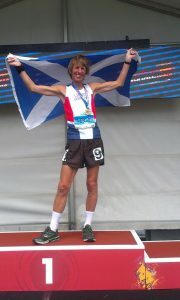 It was a busy and again successful weekend for club athletes competing in Scotland, England and the Czech Republic. 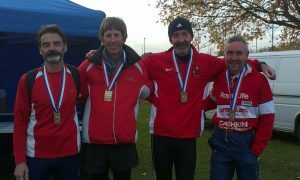 Down south the Cambuslang M55 team of Frank Hurley, Paul Thomson, Dave Thom and Colin Donnelly were emphatic winners of the UK 055 Male Cross Country Relay Championships. Colin recorded the fastest time in his age group and Dave was 3rd fastest. Colin Feechan deserves thanks for being team manager, reserve and driver. Elsewhere Kenny MacPherson finished 3rd M45 in the Brampton to Carlisle 10 mile road race and Alasdair Campbell was the first athlete home in the Glossop Parkrun. The Stewart family also performed well in the Czech Republic. 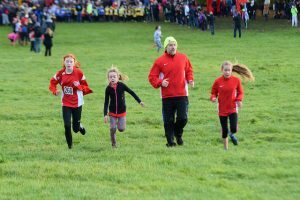 Eddie, who was one of the mainstays of the record breaking Cambuslang senior team in the late 1980s before moving to Prague, showed that even within a month of his 60th birthday he is still a force to be reckoned with when winning an open 6K cross country race. 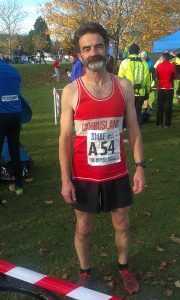 Since resident in Prague Eddie has returned to Scotland to win the Scottish Masters O40, 45, 50 and 55 Cross Country Championship titles. His daughter Moira was the first U23 runner in the Czech Ladies Cross Country Championships and gained selection for their team in the forthcoming U23 European Championships. 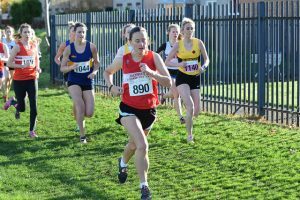 Moira is a former Scottish under 20 1500 Metres Champion and was a member of the Cambuslang Harriers ladies U20 team which won silver in the Scottish Cross Country Championship. His son Gerron, a sub 2 minute 800 metres runner, finished 16th in his first year in the U20 age group. It is not surprising that both Moira and Gerron are talented athletes given Eddie’s running pedigree and their mother’s as Mia herself was a senior Czech internationalist and is still winning Czech Masters Championship medals. U20 athlete Eve Mackinnon running for Edinburgh University was an excellent 3rd in the Scottish Universities Ladies Cross Country Championship with Alex Lamond representing Strathclyde in 5th place. Both ladies should have done enough to gain selection for the Scottish Ladies University team in the forthcoming competition in Edinburgh against teams from the North, West and East of Scotland. 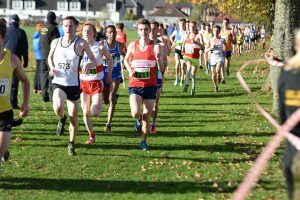 While a number of members were involved in a Glasgow endurance training session the main domestic racing focus for the club was on the Lanarkshire Cross Country Championships at Coatbridge where Cambuslang won a number of individual and team medals. U13 Niamh Riggins gained individual gold and with support from Millie Nicholl and Maura MacKinnon secured team bronze. The U13 boys team of Fearghus MacGregor, Stewart Millard and Robbie Woods went one better to lift team silver. In the U15 girls race Ruth Kelly won silver and Keir Crawford, Caoloan Millard and Michael Black combined well to take team silver in the U15 boys event. In the U17 boys event 2nd placed Drew Pollock led Ryan Stephen and Andrew Carey to team gold. 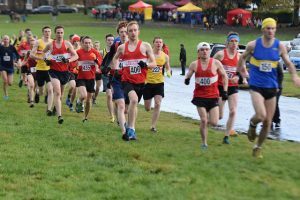 The U20, seniors and masters women and men also contributed to the club's success at the County Championships. 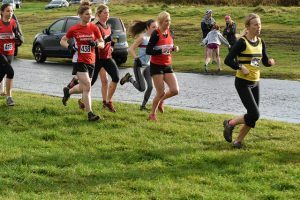 The club had its largest representation ever in the ladies event with 7 athletes taking part including Claire Mennie and Julie Dell who were making their debut for the club. The trio of Kirsty O'Brien, Bernie O'Neil and Lesley McCardle finished 3rd team with Bernie being awarded the bronze O40 medal. Erica Christie missed out on a team bronze medal as she can't count as a team member until the 1st December. The men too had a large representation with 17 athletes competing. U20 Brendan Carey who has been training consistently well was a clear winner in his age group. Not surprisingly with Ryan Thomson, Robert Gilroy and Alistair Campbell in first, second and fourth place the club were decisive winners of the team competition. Robert was also the first master O40 and Justin Carter runner up. Athletics is not just about the runners it is also about the back up team of coaches, officials, parents and supporters. The club is therefore grateful to all those who volunteered their time to assist at the Lanarkshire event. Special mention should be made to Simon Gold who again stepped in to be one of the two required race volunteers having finished 4th earlier in the morning at the Tollcross Parkrun behind the winner Cambuslang’s Shaz Hakeem. Justin Carter also acted as a timekeeper before lining up for the men’s race. Unfortunately it can often be difficult getting volunteers to assist at Lanarkshire events and it would be good to think that new volunteers will come forward in the future rather than the club having to rely on its small band of regular volunteers. Being Scotland's only entrants at the British Masters XC Relays champs, held in Long Eaton, England, and with healthy competition to make the 4-man M55 team, the team left East Kilbride a little before 7am with high hopes of bettering the 4th place showing in the BMAF Masters road relays in May, when they narrowly missed out on a podium position. With some wintry conditions forecast en route, leeway for planned for any hold ups (thankfully only one 10-minute delay), and a nice breakfast stop, and we arrived in plenty time at Long Eaton at 12:15pm in time to see the ladies and M65+ 3-leg race starting. Plenty of club tents, a big start/finish sign, a well laid out course, and a plethora of runners all kitted out in their club colours added to the occasion. The team was declared, and a recce of the 3k course revealed it to be fairly flat, suitable for either studs or short spikes. Although the XC races are not as popular as the road races, we were competing with 18 other teams for medals, with Woodford Green & Essex Ladies, ahead of us at the road relays and with whom we've have a number of great tussles over the years, looking particularly strong rivals. Our race plan was to start well and to get into the mix, giving our mid-pack athletes someone to chase, before handing over to our strongest athlete Colin on the last leg. The experienced Frank Hurley, after his excellent 4th place last week in his last year as an M60 at the British & Irish XC International, was asked to get us off to a strong start, and whilst he said he was only getting warmed up when he finished the race, it was job done as he came home in 3rd place (11m35s), only 21 seconds behind Wolverhampton & Bilston in 1st and Salford Harriers in 2nd place. Woodford Green were back in 7th place with other contenders Sheffield RC in 9th place. Paul Thompson was up next and the recently much travelled dual world masters champion set about his task with gusto, and finished having moved us up to 2nd place (11m13s) after overhauling the Wolverhampton athlete, the gap behind new race leaders Salford was down to 17 seconds. Bristol AC were now in 3rd place with Woodford Green and Sheffield RC up to 5th and 6th respectively. Dave Thom's welcome return to form has been a big boost to the team, with his solid run at last week's international bringing renewed confidence. Dave knew exactly what was required of him and took the lead half way through his leg at the only muddy part of the course, and by the end of the leg he had given the team a comfortable 29-second lead with an excellent 11m10s, the fastest 3rd leg time. The other medal positions remained the same with Woodford Green closing in to 4th place, some 1m50s behind. 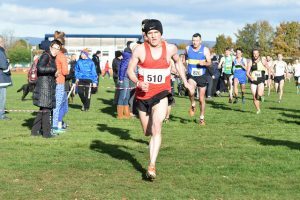 After anchoring the M50 team to Scottish XC relay victory in October, Colin Donnelly took off on the last leg, and after some serious knee injuries which threatened his career over the last few years, he is once again in superb form. 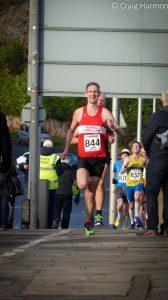 Although the course was somewhat flat for this highly renowned hill runner, Colin was not hanging about as he made it look easy in recording the fastest M55 time of the day in 10m26s, over 30 seconds faster than anyone else. This saw the club finishing with an emphatic winning margin, over 2 minutes ahead of Woodford Green, with Sheffield RC moving in to the bronze medal positions on the last lap. Often inadvertently overlooked by our English commentators, it was nice to see Mel James on the P.A. giving due credit to the farthest travelling team as Colin brought us home. Mel also confirmed that next years champs will return to Long Eaton, as race is growing in popularity with masters clubs. Our post-race group warm down was all done together in club colours before we waited for the medal ceremony, with some appreciated nice comments from fellow runners. It was a very happy car on the way back up North, stopping off near Kendal for a nice pub dinner and a celebratory pint (or two!). As usual the camaraderie, banter and stories were flowing throughout the journey in what turned out to be the perfect execution of our plan, and we were back in East Kilbride by 9:30pm as British Masters XC champs, with talk already about defending the title next year, with hopefully even more representation from the club as well as other Scottish Masters teams. 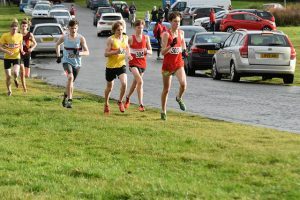 The Cambuslang quartet of Ryan Thomson, Craig Jardine, Stuart Gibson and Robert Gilroy finished in 14th, 15th, 22nd and 28th positions from 364 runners to secure Scottish team silver medals against top opposition over a flat fast course at Renfrew. Robert had the additional bonus of lifting the Scottish O40 Masters Award. Again the club with 26 runners had the highest number of finishers among all the clubs competing in the men’s race and 14 of our members filled the first 91 places and were also under 14 minutes for the 4K course. In addition to the club’s 4 silver medallists Alistair Campbell, Gavin Smith, Alasdair Campbell, Paul Morrison, Gordon Robertson, Ross Stephen, Bobby Bristow, Scott Sommerville and Matthew McKenna all broke the 14 minute barrier. Justin Carter was 4 seconds over 14 minutes and was followed home in quick succession by Brendan Carey, Colin Reilly, Johnny MacNamarra, Brian Douglas, Alick Walkinshaw, Iain Nicholl, Des Dickson, Chris Upson, Scott Hunter, Mick O’Hagan and William Fairley. 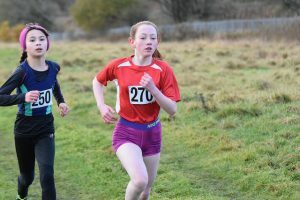 The club had 6 ladies competing in their event although U20 athlete Eve MacKinnon was running for Edinburgh University. First club athlete home in 39th spot out of 187 finishers was Alex Lamond, followed by Eve, with Katie Bristow next in her first race after a long injury spell and then the trio of masters Jennifer Reid, Bernie O’Neil and Erica Christie. Erica was delighted to be awarded the Scottish O60 Ladies Masters Title. 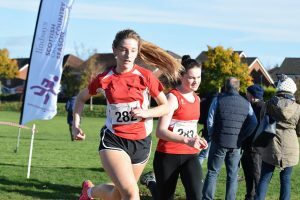 It was a great experience for all female competitors to be running against the 1500 metres Olympian and UK record holder who displayed her class to win the race by 40 seconds from her nearest rival. 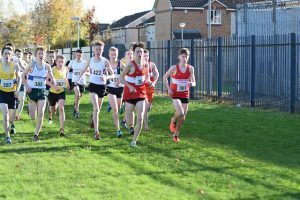 A number of under15 and 17 Cambuslang athletes contested the 2K event. Christie Dalgleish, Carla Fay and Chloe Burton represented the U15 girls while Katie Moss and Ruth Kelly competed in the U17 race. Under 15 runners Sean Friel, Arron Grew, Michael Black and Liam Angley took part along with their U17 team mates Ryan Stephen, Eamon Carr and Andrew Carey. Ryan after a period of injury is gradually building up his fitness again. 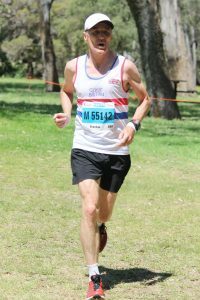 Members of Cambuslang Harriers have been making their presence felt not only in Scotland but also in Australia at the World Masters Championships. 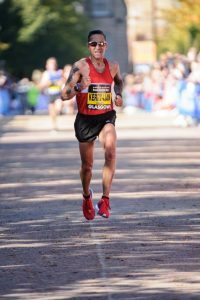 Kerry-Liam Wilson was the deserved winner of the Scottish Masters Athlete of the Year Award at the Scottish Athletics Awards Ceremony for his multi success on road, country and track at Scottish, UK and European level. 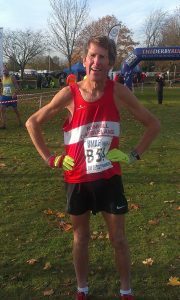 On the road he won Scottish M40 gold at 5K, 10 miles and at the half marathon, UK gold at 5K and European M45 silver in the half marathon. He also secured M45 gold in the Scottish 3K indoors along with Scottish and UK M45 5K gold medals as well as setting M45 age group bests for 5 and 10K . 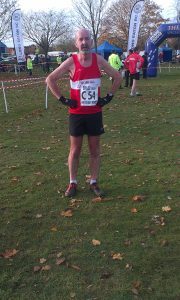 Kerry-Liam further demonstrated his versatility by winning the Scottish M45 Cross Country title. 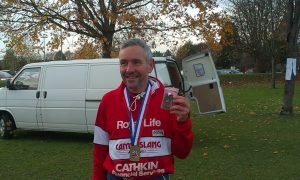 In addition he was a vital team member in helping Cambuslang win all of last season’s M40 Scottish team titles on road and country and to achieve UK team silver in the UK O35 6 man road relay championships in Birmingham. Cambuslang have been represented by Paul Thompson, Colin Feechan, Archie Jenkins and Lynne Marr at the World Masters Championships in Perth Australia. 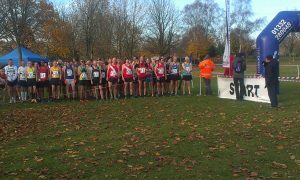 Paul just missed out on a bronze medal in the M60 cross country event but his 4th spot led the UK team to bronze medal. However, 2 days later Paul turned the table on the 3 athletes who had earlier beaten him to win M60 5K track gold in warm and windy conditions. This was a truly incredible but deserved performance by Paul who on the day executed his race plan to perfection. 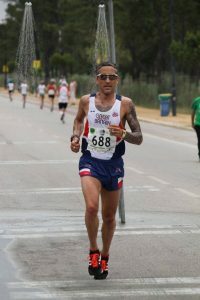 Colin in spite of long standing injury problems battled on gamely in the M55 cross country event to help the UK team achieve silver medals and a few days later in very warm conditions finished a creditable 8th in the 10K track event. Archie while acting as one of the British team managers also found the time to contest the M60 cross country and 5K track events with Lynne also doing the cross country and 800 metres events.